My Name is Martin, a blogger who happens to like making money. Throwing figures like earn 400,000 in Kenya shillings in a country where the average middle class is earning Kshs 50,000 is bound to elicit quite a huge conversation. They look forward to earning Kshs 400,000 like you suggested. Some of us will want to see your online properties and see how this person earning enough to tell us what direction to follow has packaged themselves. If you earn kshs 400,000/- and below you are wasting yourself in employment. Get a real Job. Start a business. I headed over to the site linked to your twitter profile, and believe you me, I did a Google search while at it. They say GYIF, anyone can Google that. First thing I noted is that your office physical address is on State House Avenue (we take good note of State House). Prime location huh! It is still all going well till I proceed to look at the other parts of the site, you know, to see whether you paid your developer something over Kshs 400,000. I didn’t get to see anything that would tell me otherwise, the site is doing most of the things it’s supposed to do, communicate. It already looks too good to be true. There is a small feature called Tinyeye that comes to play here. By the way the reason I though about Tinyeye is that this team of dynamic youth seem to have only faces, no names. So, back to Tinyeye. The supposed team performs quite well on tinyeye, no need to download. Do it yourself, just move an image from “the team” over to tinyeye.com and see reverse results showing that these are indeed shutterstock images by a certain Dean Robot among others. 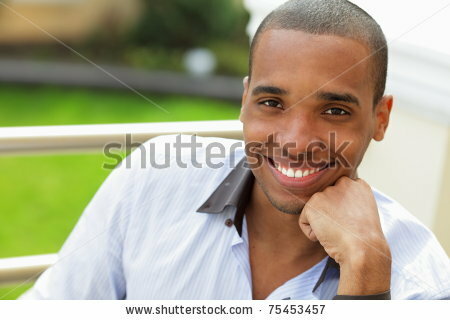 The images are actually tagged “young African man” with various iterations to it like young smiling African. In order not to assume too much, I did a second search, and a third and 100% of my searches returned a Shutterstock image. Totally beautiful team you got there, huh? Boom! Thank you Martin I knew this was Bravo Sierra the moment he posted that unfortunate tweet. Good work you covered it well. I felt that being intimidating for the average employee, but that wasn’t the wrong part, it’s good for people to be optimistic. Remember not everyone can be an entrepreneur, and not every entrepreneur is making 400k. When you have standards be sure you will be judged by the same standards. Yet none are listed on the page.